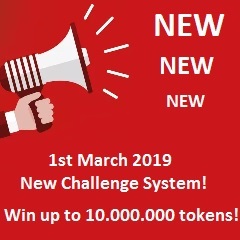 1st March, 2019 new Challenge System. in monthly contest! Exchange tokens to any coin! 7 faucets, 5 crypto currencies + coinpot tokens. automatically to your Coinpot balance. No need to reach minimum withdrawal at every site. Instantly convert coins to each other. Minimum withdrawal from Coinpot is only 10000 satoshi! No fee!